When in London for the first time, you will definitely want to visit the most popular touristic objectives and British landmarks, the ones that you have read about on all the famous travel blogs and websites, in travel brochures and magazines. In order to do this, as a foreigner, it would be best for you to try and book a room or suite at a Central London hotel. This is a great way to not lose yourself in the complicated public means of transport scheme in London. A great example of a good accommodation is the Novotel London Waterloo Hotel. It is located at a walking distance from all the major local attractions that you are dying to see in this beautiful capital city. Imagine what it feels like to visit Big Ben, the London Eye and other similar stunning British objectives whenever you want to. In addition to this, the hotel will pleasantly surprise you with other important benefits. For example, you get to choose from a large variety of rooms, enjoy a delicious buffet in the morning and exquisite international dishes during the rest of the day. The accommodation also provides lounges, spa facilities and many others, all for your relaxation and general wellbeing. In order to get a Luton to Novotel London Waterloo Hotel Transfer by rail there are several options. First of all, you could take the train from Luton Airport Parkway (every 20 minutes) via West Hampstead Underground (every 5 minutes) and ending with a 19 minute walk. This journey will take about 1 hour and 7 minutes in total. The second option is a bus from Airport Bus Station (line 757 – every 30 minutes) via Victoria Coach Station (every 5 minutes), ending with a 4 minute walk. This journey lasts about 1 hour and 31 minutes. You can also choose a bus from Airport Bus Station (line 888 – every 10 minutes) via Luton Airport Parkway Station (every 20 minutes) and Victoria Coach Station (every 5 minutes). This trip takes 1 hour and 32 minutes of your time. A Luton to Novotel London Waterloo Hotel Transfer by car can be done by taking the M1 motorway. Luton Airport is at a 34.3 miles distance from Novotel London Waterloo Hotel. This journey will take about 56 minutes, without including traffic. A Luton to Novotel London Waterloo Hotel Transfer with 247 Luton Airport Transfer is going to take about 1 hour and 22 minutes, including rush hour traffic. 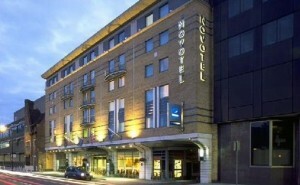 The price for a Luton to Novotel London Waterloo Hotel Transfer starts from 58 GBP.